Eureka, this is another post concerning wild yeast isolation from a commercial beer. 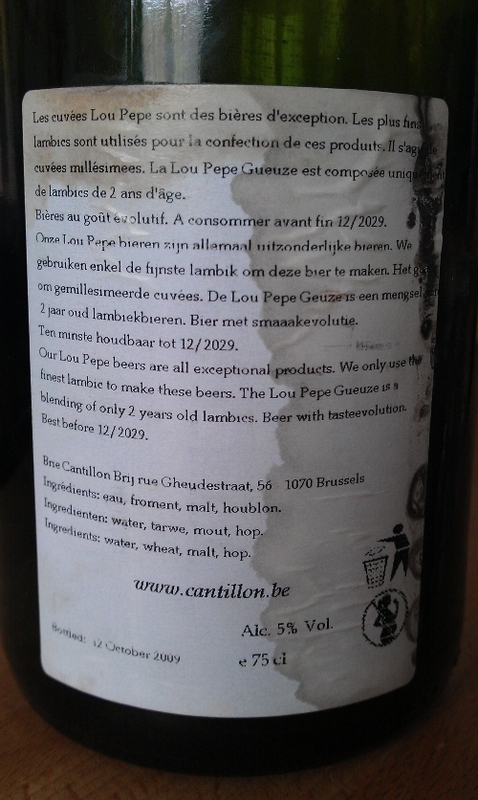 Today’s beer is Cantillon’s Lou Pepe 2007 Gueuze. I got a bottle of this particular Gueuze a year ago and stored it for another year in my cellar. By the end of June 2012, I finally got the opportunity to open the bottle and taste it. Before heading into the tasting notes, let me give you some background information about the beer. The label on the bottle says: “Our Lou Pepe beers are all exceptional products. We only use the finest lambic to make these beers. The Lou Pepe Gueuze is a blending of only 2 years old lambics. Beer with tasteevolution. Best before 12/2029” (Fig 2). It comes in 0.75 L bottles and 5 ABV. Bottled on the 12th of October in 2009. Taste: Very light sourness, pretty dry on the palate, grainy. Some lemon and wood notes as well. Rather nice sourness (no vinegar). Subtle notes of funkiness. Overall: Not bad and very easy drinkable. Not a very sour and complex Gueuze compared to others. However, a good example for the style. My rating: 80/100. I expected this beer to be more complex and less astringent. I then streaked some of the bottle’s sediment on some Sabouraud agar plates and left the plates at room temperature for approximately three weeks until colonies were visible. I could observe two different kinds of colonies (Fig 3). The most colonies were similar to the whitish colonies marked as 2 in Fig 3. And there were some darker colonies (light beige) marked as 1 in Fig 3. Nearly two years after bottling the Gueuze there are still some living organisms in the bottle. 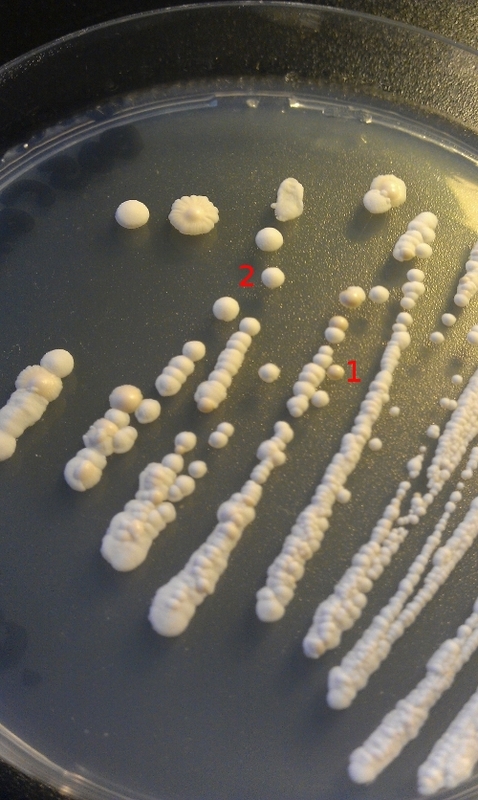 The morphology of these colonies is very similar to other Brettanomyces I isolated before. I expect these colonies (marked 2) to be Brettanomyces. On the other hand, I have no clue what the microorganisms in colony 1 could be since the color is very different from Brettanomyces or Saccharomyces colonies. Maybe the micrographs give me further information? Next step was to do some microscopy observations of the two different colonies. Lets begin with the colonies marked 2 in Fig 3. To me, the colonies shown in Fig 4 and 5 look like a kind of wild yeast. At least no Saccharomyces cerevisiae for sure. Or any other kind of bacteria due to the size of these cells. 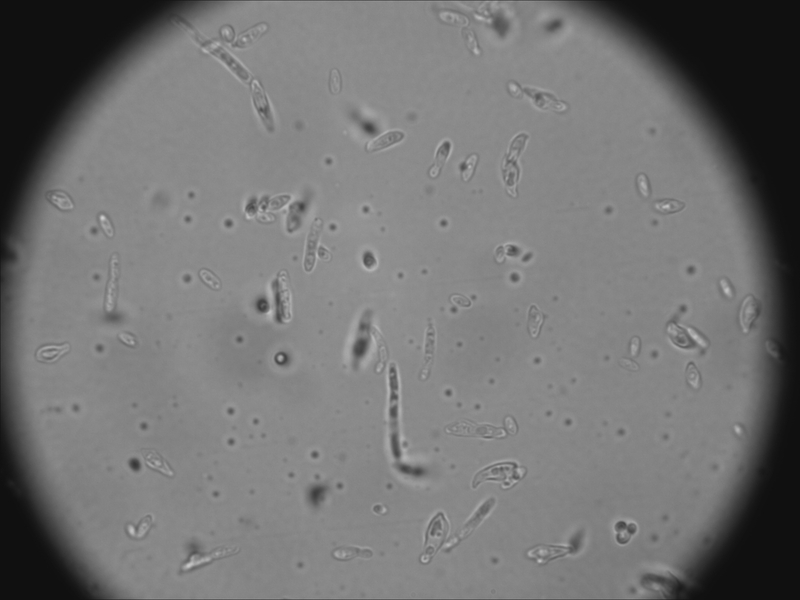 I expect these cells to be Brettanomyces due to the elongated shape of the cells and other characteristics. The cells could be Kloeckera apiculata, Pichia membranaefaciens or Hansenula… The list is not complete here. Further investigations are necessary. What about the other colonies? First of all, the cells shown in Fig 6 and 7 look very different from the ones shown in Fig 4 and 5. 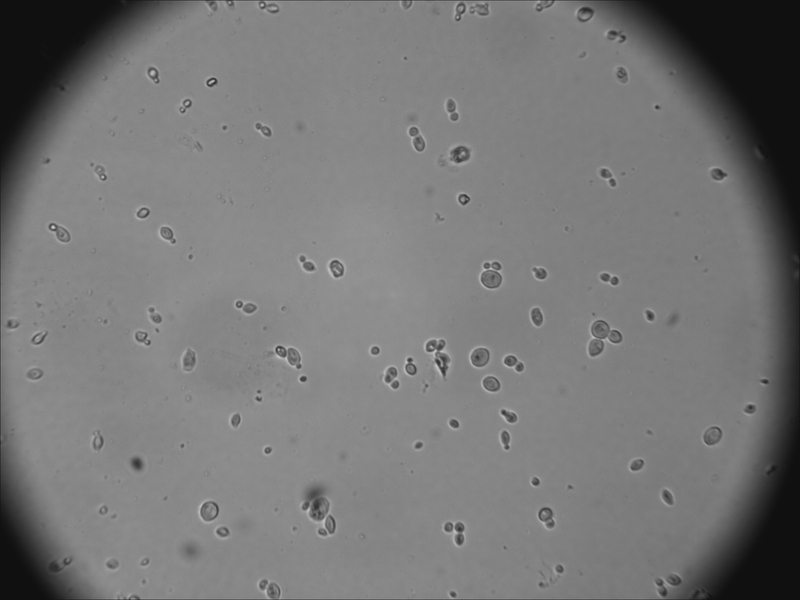 These cells here are mostly circular and look very similar to Saccharomyces cerevisiae cells. 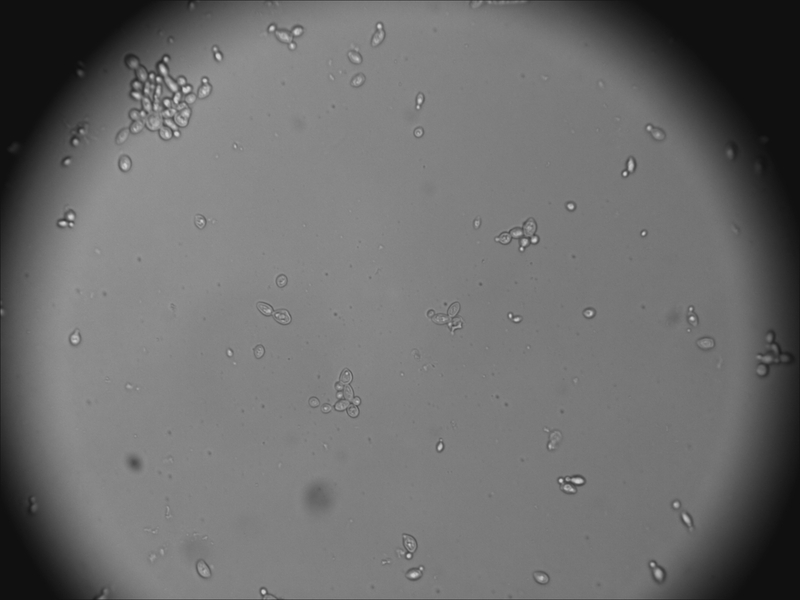 Aggregation of Saccharomyces cerevisiae as it can be seen on the upper left corner in Fig 7 can be observed in wheat yeast samples as well. For me theses cells look like typical Saccharomyces cerevisiae cells although some cells seem to have a more elongated form as well. I will have to do further investigations to get more information about the cells in colony 1. 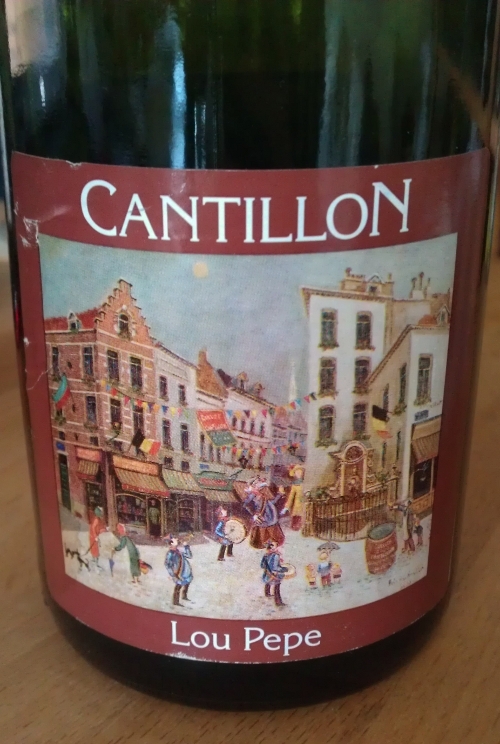 Wouldn’t it be cool to have isolated some Saccharomyces cerevisiae yeast cells from an old Gueuze from Cantillon? To summarize, I could isolate two different kinds of yeasts from a Cantillon Gueuze bottled in 2009. I have a strong feeling the cells from colony 2 belong to the specie of Brettanomyces. This is just a feeling. 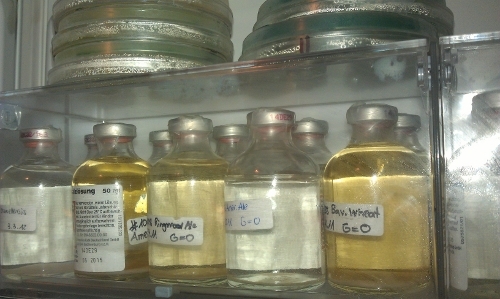 The strains go into my library as B05 (colony 2) and Y03 (colony 1). Further investigations are necessary to differentiate the two different strains. Cool stuff. The only verified conclusion here is: It is possible to isolate some yeasts from a Gueuze that is nearly two years in the bottle. Stay tuned for further yeast related posts! Eureka, today is the last post in the series about yeast banking at home (or in a lab). Please refer to the yeast basics page for links to all the other posts. The three previous methods (agar plates, isotonic sodium chloride solutions and agar slants) work all at room temperatures or colder. But not below 0°C (32°F) since the yeasts would probably die and the media (agar and sodium chloride solution) would freeze. Storing your yeasts at colder temperatures prevents some of the growth. If the yeasts do not grow during the storage time, the chances are high to have the same exact strain after you revive them. If you store your yeasts in a refrigerator your yeast can grow (even slowly) and might mutate and try to adapt to the colder temperatures. The yeasts could therefore change and maybe lose specific characteristics. This could lead to loss of flocculation or even loss of your most loved aroma profile (banana or clove aroma in wheat yeasts for example). However, such a conversion does not have to happen. It might. And this is why a lot of labs store their microorganisms or cells at lower temperatures such as -80°C (-112°F). At this low temperature no growth occurs. Even the whole metabolism of the cells arrest. The cells kind of stops entirely. You can store your cells at this temperature for nearly forever. I am not sure how many of you out there have a -80°C freezer at home. Most of you might have a freezer at around -20°C (-4°F). And you can store your yeasts at -20°C as well. Just don’t use a freezer with thaw-cycles. The only disadvantage here is the metabolism of the yeasts might still work and some changes could occur as well. In comparison to a storage at room temperature or colder temperatures, far fewer changes can/do happen at -20°C. And this is why freezing your yeasts is as far as I know the only method to bank your yeasts over a longer period of time (years) at home. As already described, this method here is about freezing your yeasts at -20°C (-4°F) or lower/higher if you want. For this purpose you use a special media which consists of a cryoprotectant (antifreezer) such as glycerin. Please don’t use antifreezer you use for your car. If you have your storage media ready you just add some yeasts to the media and put it in your freezer and leave it there until you want to use the yeast for a future batch. Please notice, this is about banking yeasts and not yeast storage. Only small amounts of yeasts will be frozen here. Not pitchable amounts. I would like to mention already, this is the most sophisticated method of all the four described already (agar plates, isotonic sodium chloride solution and agar slants). I do not recommend to go with this method if you haven’t tried one of the previous ones before. If you are new to yeast banking try to bank your yeast with another technique than this one before and get some experience. I recommend the isotonic yeast storage method for beginners. If you manage to revive the yeasts without an infection you might step forward to this method. If infections occur regularly, try to find the source for the infection and work on that. This method here does not work if you have troubles with your sterility and cleanliness… It just does not. In addition, the technique below is just one way to do it. I am certain there are other ways to freeze your yeasts. – Media. I guess dried malt extract solution or even an isotonic sodium chloride solution could work as well. I use a lab media (called YPD) as a storage media. And add some ascorbic acid as well. More about my storage media later on. – Sterile pipettes, micro pipette with sterile tips or a sterile syringes. You need sterile devices to add the storage media to your containments before freezing and get the yeast out of the containment for reviving. See “bank the yeast” description below for further information. First, get the freshest, purest yeast you can get. This could be from a starter or from a fresh yeast package or vial. This is very crucial. If you freeze unhealthy yeast you could risk to either loose them entirely or have problems during reviving them. Or a different outcome of a batch of beer (attenuation, taste, flocculation etc.). Please do not freeze or bank any unhealthy yeasts. And don’t expect the yeasts to come around during banking. If you have problems during a fermentation (stuck or whatever) don’t bank the yeast afterwards and hope the yeasts will be fine. They probably won’t. What yeast sources could you use? Get yeast directly from a fresh yeast starter. Wait until no more growth occurs. Then mix up the whole yeast starter to get the yeasts back into solution. Remove some of the volume from the yeast starter and fill your pre-sterilized containments. If you want to cool down the yeast starter to let the yeasts settle to the bottom of the flask and discard as much of the yeast starter as possible (and only pitch the yeast sediment), remove the yeasts for banking before cooling down the starter. Store the filled containments for 48 h in a refrigerator. During this step the yeast build up some important molecules they need to survive and settle to the bottom (Fig 2). Remove as much of the supernatant as possible (Fig 3). This can mostly be done by just inverting the tubes, vials etc. The yeast sediment at the bottom should stay at the bottom. Just don’t turn the tubes too fast and too slow. You now should have a nice yeast sediment at the bottom (Fig 3). The volume of the yeast sediment should be below 10% of the volume of the containment. If it is a bit more or less don’t worry. However, discard some of the sediment if it is more than 20% of the volume. Then proceed with the steps described as “bank the yeast” below. Use yeast from the manufacturer directly. 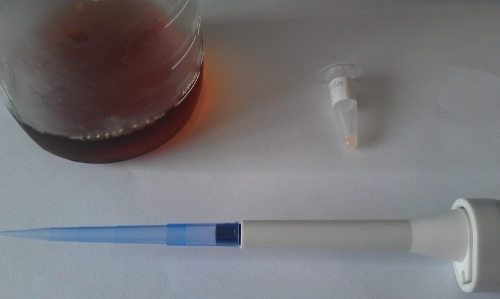 Make a small yeast starter and add a few mL of yeast slurry from the package or vial (Fig 2). I use glass tubes for this purpose which are filled with 4 mL of a malt extract yeast starter media (10 g of dried malt extract dissolved in 100 mL of water) and sterilized them in a pressure cooker. Leave the starter at room temperature for 48 h. Then proceed with the steps described as “yeast starter” above. If your yeast is very fresh, you might skip the whole starter-step and bank the yeasts directly. Therefore fill your containments with the yeasts and let them settle down in a refrigerator for 48 h then discard the supernatant. Then proceed with method described as “bank the yeast” below. I would not recommend to directly bank yeasts from a slurry. At least wash them first to get rid of trub and any dead cells and do a small yeast starter. Just harvest a small amount of the sediment (like 100 mL) and wash them with sterile water for a few times until only the viable cells remain. Discard as much of the supernatant as possible. Then make a small yeast starter (100 to 200 mL), add the washed yeast cells and leave the starter at room temperature for 48 h. Then proceed with steps described as “yeast starter” above. Procedure is similar to “yeast package from manufacturer” above. Make a small yeast starter and add some of the bottle sediment. Leave the starter at room temperature for 48 h. Then proceed with steps described as “yeast starter” above. 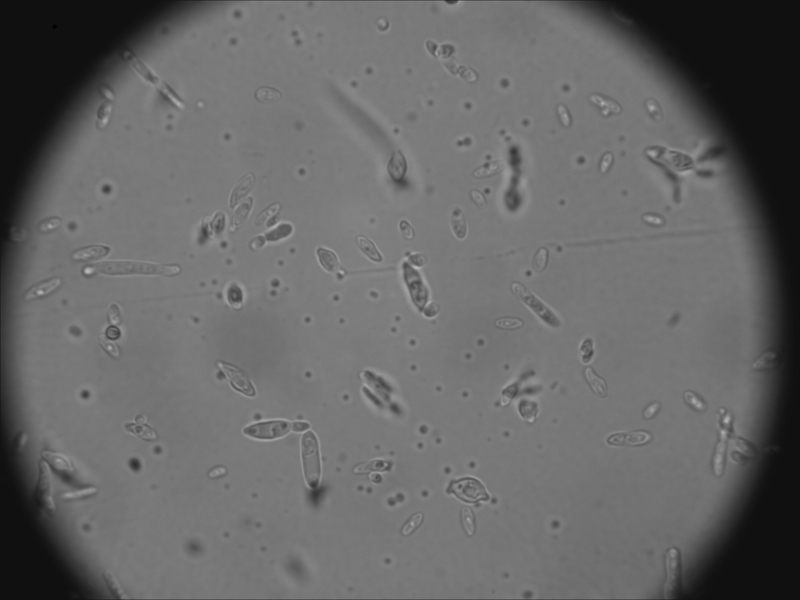 The yeast sediment you now have in your containments should consist of very healthy and pure yeast cells (Fig 3). Now its time to add the storage media (see below) and freeze the yeasts. I add about ten times the volume of storage media for every volume of yeast. In my case I have about 0.05 to 0.1 mL of yeast sediment (Fig 3). I therefore add 0.5 mL of storage media. To add the storage media you need a sterile device such as a pipette, micro pipette with sterile tips or sterile syringes. Please pre-sterilize the storage media in a pressure cooker for 15 min if possible. Let the storage media cool down to room temperature first before proceeding. Then add the media and either gently shake the tubes, vials or use the pipette, syringe, micro pipette for a thoroughly mix. You are basically done. Just label your containments very well and put them in your freezer. Done! 1. Malt extract based (haven’t try this one): For 100 mL of storage media use 10 g of dried malt extract, 50 g of glycerin and fill up to 100 mL with water. Add 0.1 g ascorbic acid (aka vitamin C) if possible. The ascorbic acid helps to stabilize the membranes of the yeasts. If you have a glycerin solution for example a 85% glycerin solution calculate the amount you need as following: 50 g divided by percentage of solution (divided by 100). In this example 50 divided by 0.85 equals 58.8 g. You therefore have to add 58.8 g of your 85% glycerin media. Sterilize the storage media in a pressure cooker for 15 min if possible. 2. YPD storage media (I use this one). The recipe for this YPD-media based storage media is from the book “Yeast: The Practical Guide to Beer Fermentation” by C. White and J. Zainasheff. For 100 mL you need: 5 g YPD bouillon, 50 g of glycerin and 0.1 g ascorbic acid. Add up with water to 100 mL. Sterilize the storage media in a pressure cooker for 15 min if possible. Put your containments in your freezer. Nothing to do more. I use a rack for my tubes to have some organizing system (Fig 4). 1. Make yourself a yeast starter. I recommend 100 mL for the first step. Therefore dissolve 10 g of dried malt extract in 100 mL of water, add some yeast nutrients if possible and sterilize the starter for 15 min with a pressure cooker. Cool down the starter to room temperature. 2. Get your tube, vial (or whatever containment you use for yeast banking) out of your freezer and increase the temperature as fast as possible. I let the tubes warm up in my hands. Then gently mix the yeast and storage media and add the whole content to your yeast starter. I use a micro pipette for this step. Then wait a few days until signs of fermentation arise (cloudiness, white foam, yeast sediment at bottom, bubbling etc.). Wait until a yeast sediment formed at the bottom. You can either stir your yeast starter the whole time or just leave it unstirred. 3. Prepare your next yeast starter. I normally do a 1 L stirred yeast starter as a second starter here. Therefore dissolve 100 g of dried malt extract in 1000 mL of water and sterilize it. Discard the supernatant from the first yeast starter and only transfer the yeast sediment to your next 1 L yeast starter. I recommend to taste the supernatant (before discarding) to check if the starter is okay. If the starter tastes bad probably an infection occurred. If the yeast starter tastes good, congratulations! 4. Repeat the yeast starter steps until you have the amount of yeast you need. It is hard to tell how many yeast starters you need and what volume you should choose. There are way too many different way on how to bank the yeasts. The only way to tell how many yeast cells you have would be to count the cells (have a look at this post concerning this topic). From my experience and with the amount of yeast I bank (about 0.1 mL as it can be seen in Fig 3), I need a 100 mL yeast starter first, followed by a 1 L yeast starter, followed by another 1 L yeast starter afterwards to have approximately 100E9 cells. This would be equal to the amount of yeast you get in a Wyeast’s Activator package or White Labs vial. My procedure looks as following. As already mentioned, I use a YPD-based storage media to bank the yeasts. And I use the tubes shown in Fig 3 for banking. 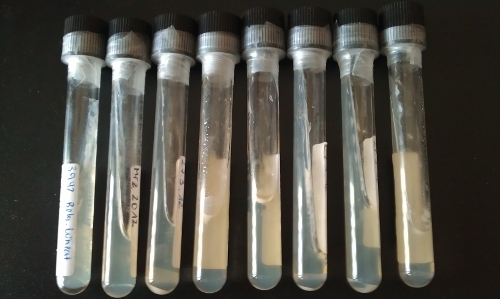 After discarding the supernatant after storing the tubes 48 h in the refrigerator, I add approximately 0.5 mL of the storage media to the tubes with a micro pipette and a sterile tip (Fig 5). Then use the micro pipette to mix the yeast and the storage media. After that the tube look like shown in Fig 1. 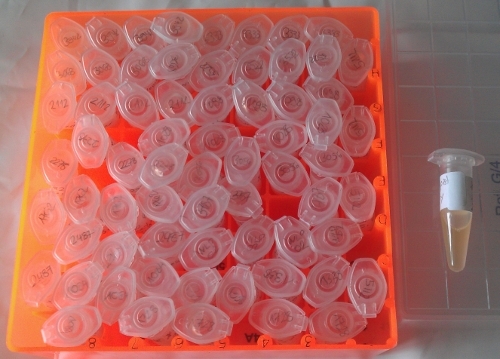 I then put the tubes in a box (shown in Fig 4) and store them in my freezer (at -20°C). What are the advantages and disadvantages for this method compared to the others? This is for sure one of the least labor intensive methods. And the only one to store your yeast over a longer period of time. On the other hand, you do need some extra equipment such as a freezer and some lab equipment (syringe or pipette or micro pipette, containments, chemicals (ascorbic acid)). I think this method is only for the people really interested in yeast banking. And I would not recommend to go with this method if you haven’t tried one of the previous ones before. Sure the long-term storage seems very advantageous. However, do not underestimate the time and equipment you need to prepare the yeast for this banking method. On the other hand, your equipment has to be very clean and mostly sterile. For all of you still interested in freezing your yeasts, I would like to mention the book “Yeast: The Practical Guide to Beer Fermentation” by C. White and J. Zainasheff again. In there are further information on how to freeze your yeasts. This is the end of the yeast banking posts. I hope I could give you some information about the topic. Please feel free to comment and ask questions if something is not clear enough. The next posts will be about some recipes, tasting notes and yeast hunting stories again. Stay tuned! Eureka, the banking journey goes on. The introduction to yeast banking and background of this particular post can be found here. Lets proceed with technique number three, banking yeasts on agar slants. Method number one was banking yeasts on agar plates, the second one banking yeasts in sterile solutions. Banking yeasts on agar slants is very similar to the agar plate method. However, has less disadvantages than the agar plate method. Lets have a look at the method. 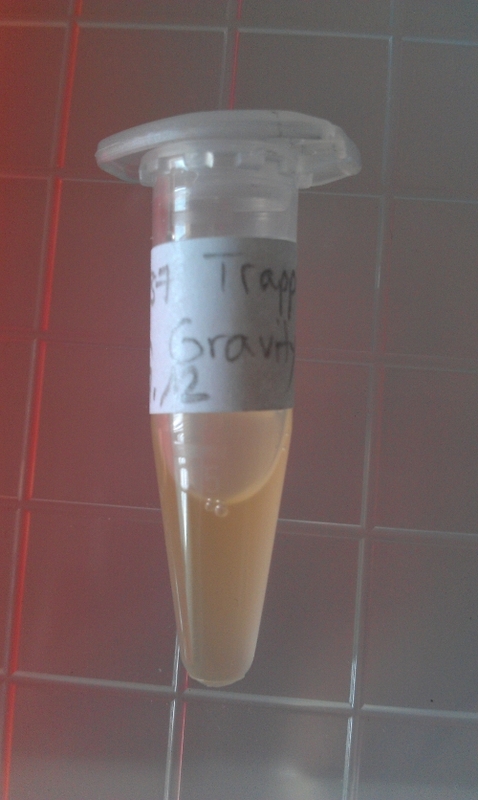 Agar slants are basically tubes filled with agar media (Fig 1). When you prepare agar media for plates you can use the same media to prepare some slants. After the agar media cooled down the media stays gelatinous. You now can streak some yeast colonies on the agar in the tube, seal the tube and leave the tube at room temperature for some days until colonies on the agar appear. If colonies appeared, the agar slant is ready for storage. Simple as that. 1. Prepare your agar media. Best would be to mix all the components for the agar media together and heat it up a bit until the agar agar is dissolved. Agar agar is not very soluble at lower temperatures and has to be dissolved at warmer temperatures. Just heat up the whole agar media (malt agar for example) until the agar agar is dissolved and then proceed to step number two. 2. Fill your tubes (or any other containment) with the freshly prepared agar media. Seal the containment and sterilize them in a pressure cooker if possible. Let the tubes sterilize for approximately 15 min. You could even submerge the tubes in boiling water for 15 min. 3. Cool down the slants. Lay the tubes sideways to get the liquid surface as shown in Fig 1. This makes it easier later on to streak some yeasts on the agar media. Wait until the agar cooled down to room temperature. 4. Store of streak. The agar slants are now ready to bank some yeast. Or can be stored at room temperature or in a refrigerator for later use. Just pick up a yeast colony or yeast slurry with a sterile inoculating loop and streak the stuff on the agar slant. The process is very similar to streaking some agar plates. If you need further information about how to streak agar plates or slants, please have a look at the agar plate post. Store the agar slants in the refrigerator (not in the freezer). You could even store them at a cold, dark place. Please refer to the agar plate post reanimation process. Let me talk about the advantages first. This is a rather easy way to bank some yeasts. You just need some tubes, agar media and an inoculating loop or any other sterile gadget to get the yeasts on the agar media. Please have a look at my agar plate post to see what equipment you could use. Second, if any contaminations happen on the agar media you might see it. However, not every contamination has to be visible. And at last, you can easily trade some yeasts with other homebrewers. Just streak some yeast on an agar slant and either wait until colonies arise and then ship or ship right after streaking. Disadvantages. Again, with agar media the yeasts still grow. Sooner or later the agar media is overcrowded with yeast colonies. This does not occur every time. And does not have to be bad after all. Its how you look at it. I do not like overcrowded agar media. I like to see single colonies… Second, because nutrients are in the agar media other yeasts, bacteria can grow as well. Contaminations can happen. Well contaminations can always happen. Independent of the yeast banking method you choose. It is therefore really, really important to keep the yeasts away from any contaminations. Concerning agar slants as a long-term storage method. I do not have any long-term experience with this method. Please let me know if someone out there has any long-term experience with this method. I would not be surprised if you could use agar slants to store yeast for months or even years. If long-term storage (months to years) is the main goal for you to get into yeast banking, please have a look at the sterile solution method or the next post which is about a frozen yeast library. I have to mention again, this is not a method to bank yeast mixtures or any other mixtures, blends etc. Since some growth still occurs, the ratio between the yeasts, bacteria etc. will eventually change. Even if the ratio of the mixture stays during the storage, it could change again as soon as you recover the mixture… The only way to store mixtures is to separate the individual strains and store them separately. To summarize. Banking yeasts with agar slants is very similar to banking yeasts with agar plates. A main difference here is the lower risk of contaminations and dehydration because agar slants are tightly sealed tubes (or any other sealed containment). The next, final post in this series is about a frozen yeast library. This is in my opinion the only way to store your yeast for a longer period of time. Stay tuned! Eureka, today I proceed with the second technique to bank yeast at home (or in a lab). I am sorry for the delay of this post. I am currently very busy and writing such a post is very time-consuming. The introduction to the banking yeast series can be found here. The post about the first technique (bank with agar plates) can be found here. Lets proceed with another technique, isotonic sodium chloride solutions (or any other sterile solutions). One way to store yeasts over a period of time is storing them in sterile solutions such as isotonic sodium chloride solutions. Isotonic in this case refers to solutions which have the same osmotic pressure as the cells itself. The osmotic pressure mainly depends on the salt concentration of a liquid. If you have a liquid with a high salt concentration, the osmotic pressure of this solution is high. On the other hand, distilled water (low to no salt concentration) has a low osmotic pressure. If two liquids with different osmotic pressures are connected by a membrane, the two pressures can equalize: Water from the low pressure solution passes the membrane and flows into the high pressure solution. The water flows until the two pressure potentials of the two solutions are equalized. Lets get back to the topic. Yeast cells have a membrane as well. It basically surrounds the whole cell. If you store your yeasts in a solution with a higher osmotic pressure than the yeast cells (lot of salts and other organic compounds are in a cell), your yeast cells will eventually die due to dehydration (loss of water). Losing water is not ideal for a cell. Think about humans, losing water can lead to severe health problems as well. On the other hand, storing yeast in distilled water could eventually burst the cells since water thrives into the yeast cell (into the high osmotic pressure solution). This is not ideal as well. The key is to prevent an osmotic pressure difference between the yeast cell and the surrounding liquid. You do so by using liquids with the same salt concentration as in the cell. You therefore have the same osmotic pressures in the cell and the surrounding liquid. And this is called isotonic. If you dissolve 9 g of sodium chloride (a.k.a table salt) in one liter of distilled water, the solution is isotonic. 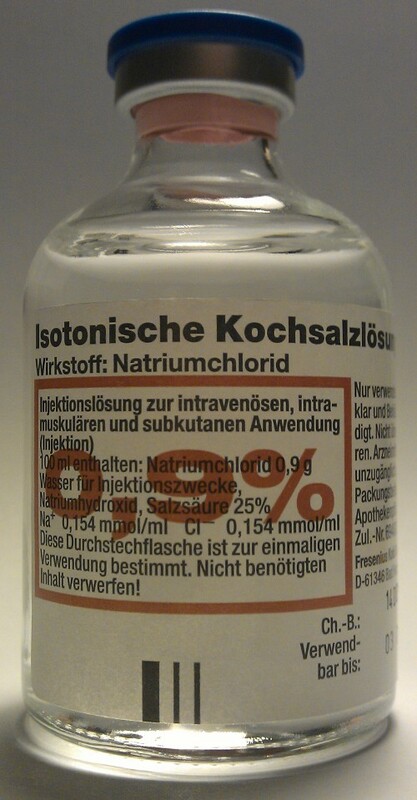 For other salts/compounds, there are lists are available to look up the amounts you need to get an isotonic solution. Sodium chloride seems to be in every kitchen and why not use it to store your yeasts. I will therefore talk only about isotonic sodium chloride from now on. First of all, you have to think about a containment for your yeast-sodium chloride solution. I used small glass tubes with a screw cap first (volume around 5 mL) as shown in Fig 1. Any other tube will do the job as well. Just keep the sterility in mind. It is best to have a sealed containment to avoid any contaminations. In addition, any containment which can be sterilized in a pressure cooker is even better. Another way to go is using ampules filled with sterile sodium chloride solution (Fig 2). These ampules are used in hospitals very frequently and can be bought in many pharmacies in Europe. Can’t tell it this is true for any other country though. You only need a sterile syringe and a cannula and inject the yeasts in the ampule. Done! I used the tubes (Fig 1) first but went with the ampule technique later on because of the volume. I first thought 5 mL of yeast solution are not enough for my purposes. Now I know, most of the ampules still contain about 95% of the original liquid… If you have the same concerns, just fill additional tubes with the same strain you use more often. If I would consider going into the isotonic solution method again, I would probably use the glass tubes with a volume of approximately 5 mL, fill them with 4- 5 mL of isotonic sodium chloride solution and sterilize them in a pressure cooker. With the ampules you need syringes and cannulae in addition. – Sodium chloride. Common table salt will do the job. Isotonic sodium chloride solution: Dissolve 9 g of sodium chloride (a.k.a table salt) in 1 L of distilled water. Depending on the water quality, even tap water would work it is low in salts. However, get yourself one liter of distilled water if you can. 1 L of the sodium chloride solution will last for many, many tubes. – If you can sterilize your containments, fill them with the isotonic sodium chloride solution and sterilize them in a pressure cooker or in boiling water for approximately 15 min. They are ready to go. You can even store the sterilized tubes at room temperature for nearly forever. Just make yourself a batch of tubes and the yeast banking can begin. – If you can’t sterilize your containments (either because they are made out of plastic and melt during the sterilization process or you do not have an opportunity to sterilize them) you need to sterilize the sodium chloride solution by boiling it and then transfer it into the containments later on. However, don’t forget the sterility of the containment itself. If you buy them as pre-sterilized, well good enough. If you buy something not sterile, disinfect it somehow. Either use diluted Javelle water or Vodka. Just remember a disinfection is not the same as a sterilization. Some microorganisms will survive the disinfection process. Either way, I would not recommend this method. Get yourself some sterilisable tubes and all the worries are gone. Now as the tubes are filled and sterilized, its time to bank the yeast. The easiest way in my opinion is to get the yeast directly from the source such as a fresh Activator package from Wyeast or a vial from White Labs. Use a sterile syringe and get yourself approximately 1 mL of yeast slurry for 5 mL of isotonic sodium chloride solution from the package or vial respectively and transfer the volume into the sodium chloride solution. You are basically done. You could even pour some of the yeast slurry from the package or vial into the sodium chloride solutions directly. Whatever works. On the other hand, you could harvest yeast from Kräusen and transfer them into the isotonic solution. In this stage the yeast cells are very viable and vital. Using harvested yeast could work as well though the viability/vitality could be an issue here. I would recommend doing a small starter with the harvested yeast first (around 10- 50 mL), decant as much of the supernatant off the yeast as possible and transfer the yeast slurry into the isotonic sodium chloride solutions. In addition, you could transfer a colony from an agar plate into a sodium chloride solution. To summarize, you could basically use every source of yeast possible. Just keep the vitality/viability in mind. You do not want to bank unhealthy yeasts. If possible, store all the yeasts in the sterile solutions at around 6°C (43°F). In general, cold temperature would be fine. Just don’t freeze them. They probably won’t survive. If cold storage is no option, store them at a cool and dark place. After a short time, the yeast forms a nice sediment at the bottom of the tube/ampule etc. To get from the banked yeast to a yeast starter. Collect 1 mL of the liquid from the vial with a sterile syringe (shake before removal to get the yeast back in solution) and transfer to around 100 mL of a 10°P sterile starter wort made with dry malt extract. To get a 10°P starter just add 10 g of any dry malt extract, some yeast nutrients, dissolve in 100 mL of water and sterilize it with a pressure cooker if possible. I use 500 mL Schott bottles for this purpose. Any mason jar will do just fine as well. Just sterilize it in either a pressure cooker or in some boiling water. This is a very crucial step because the yeast cells from the isotonic sodium chloride solutions might be quite slow growers at the beginning. Any contamination in the starter will outgrow the yeast for sure. And don’t use too large starters for this step. Let the fermentation go for some days (up to seven days if necessary). A small layer of yeast will form. Then increase the volume up to 1 L in total (add 900 mL of freshly sterilized 10°P wort on top or transfer the 100 mL starter with the yeast to 900 mL of fresh wort). After the 1 L starter, there should be roughly the same amount of cells as in a fresh Wyeast activator package (100E9 cells). This may vary between yeast strains. Use a counting chamber to determine the exact cell concentration and cell amount if possible or estimate the cell count from the yeasts volume. I use(d) this method for quite a while and all my yeast from my yeast library are/were in sodium chloride solutions at one point. 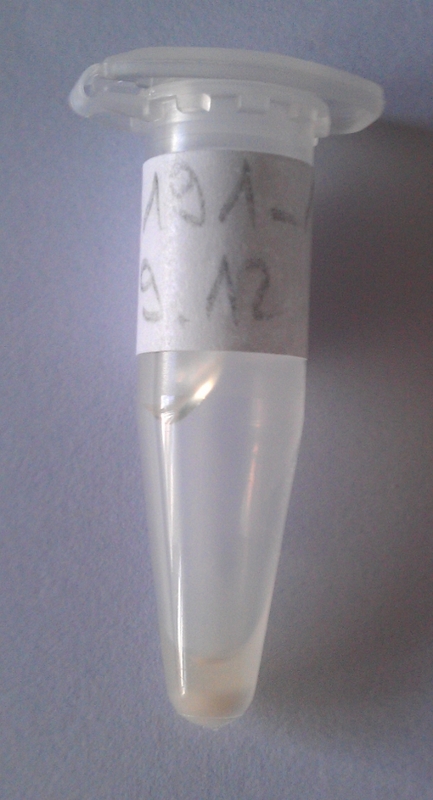 My oldest strains are in the ampules since Summer 2010 and I could reanimate them successfully in Summer 2012. 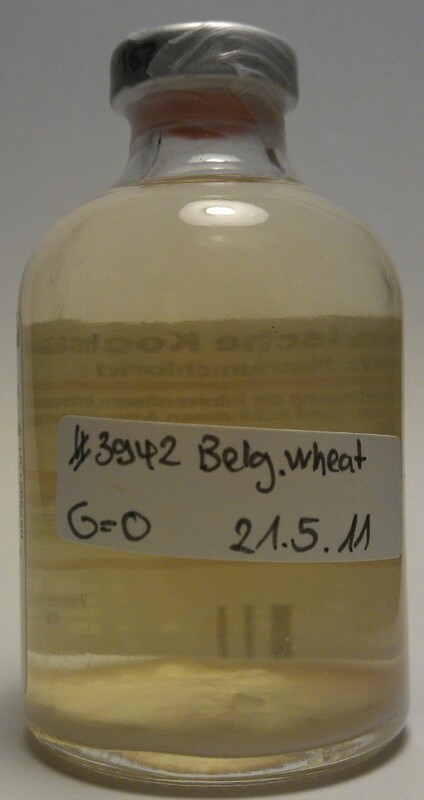 In my experience, the yeasts can be stored this way for at least two years without any problems (refrigerated at 6°C). This holds true for several different yeast strains. However, I lost some of the strains due to an infection. Not a lot of equipment necessary Long term storage? All in all, this is a really easy and cheap method in my point of view. I had a hard time to find disadvantages for this method. I do not bank my yeasts with this method anymore because of the space it needed. Please consider that we are talking about 40 different strains in my case. My refrigerator is basically filled with ampules… Some of them in two ampules… Another disadvantage is the observation of contamination. Other techniques (such as the agar plate method) are easier to identify any contamination. However, I would not expect any contaminations to occur if you work cleanly and with sterile equipment. The only unsolved question remaining is “how long can you store the yeast with this method”. From my experience, yeasts can be banked for two years at least. Without any maintenance work. Another disadvantage of this method is storing yeast or yeast/bacteria mixtures. Storing mixtures with this method might change the ratio between the yeasts or yeasts and bacteria strains. On the other hand, there is no useful method in storing mixtures after all. Even if you manage to keep the ratio between the different strains constant during the storage, during the reanimation the ratios might change again… If you want to store mixtures, the only way would be to first determine the ratio of the different strains present and then separate them and bank them separately as well. Then create the mixture from the banked cultures again. Very labor intensive and not easy (been there). This even goes way beyond the topic of this post. To summarize, banking yeasts in sterile solutions is a rather easy and cheap method. Not only is it less labor intensive than banking with agar plates but less expensive as well. From my point of view, this is a method where you can bank yourself yeasts for at least two years in a rather easy way and rather low in maintenance work. If I have to recommend a banking technique, I would recommend banking yeasts with sterile isotonic sodium chloride solutions. In addition, you can even easily trade your yeasts with other homebrewers. The next post will be about banking yeasts with agar slants. Stay tuned!